Southville 7 was one of many communities hard hit by Typhoon Glenda in July 2014. Several houses and community facilities were damaged but thankfully everyone was safe from harm. Stories about residents helping their neighbors were shared, reflecting a hopeful sense of community amidst strong winds and rain. Our organization is grateful to our community members, project partners, donors, volunteers and staff for helping Southville 7 build back better. Through their help, we were able to rebuild not only houses and community facilities but also families that were affected by the typhoon. The SM Health and Wellness Center has been instrumental in providing basic healthcare to residents of Southville 7. Despite the damaged ceiling, our team of healthcare professionals, including twenty (20) Community Health Workers, a resumed operations a few days after Typhoon Glenda. Healthcare services were later extended to dental care when ALKFI and Ivoclar Vivadent inaugurated the dental clinic and equipment in December 2014. Our dentist, Dr. Amorfina Anda, provides free dental services such as basic cleaning, tooth extraction and preventive dental care. MML Grandstand - The BNJ community cares for the sports development of the residents especially of the children. The Manolo M. Lopez Grandstand is one of the community facilities that have been affected by the typhoon where the annual BNJ football festival is held. Zontaville Houses - Among damaged housing units were located in a block of steel-frame units in Site 1 of Southville 7. After the typhoon, the National Housing Authority temporarily transferred the 42 affected families to unoccupied houses just across the block. Habitat for Humanity, meanwhile, rebuilt the Zonta Club-funded units using concrete-interlocking blocks. Lilibeth Bando’s family and 41 others returned to reconstructed houses in January 2015. Habitat for Humanity plans to finish repairs on 70 more units within the year. Southville Dayap Elementary School - ALKFI received commitments from Lopez Group Foundation, pledging to repair damaged the school buildings of the Dayap Elementary School Annex. The repair works will be completed in August 2015. The Energy Development Corporation (EDC) has also announced plans to plant indigenous trees and build a plant nursery in the school grounds. The Parents-Teachers Association, meanwhile, will set up an eco shed to complement waste management practices inside Southville 7. Legacy of Light Village – Houses in the Legacy of Light Village were not spared from Typhoon Glenda. Several assessments and house-to-house inspections were conducted to determine the extent of the damage and recover undamaged materials that can be still used in the repair. The house designer, Architect Edgardo Reformado was consulted to make sure that the “Panibahay” design was retained in the reconstruction. To date, 24 houses have been turned over to the community. The repair on the other houses will be finished in October 2015. “Maganda na, matibay at maayos na, Marami nang pinagbago yung bahay namin. Mas maganda na ang view kasi jalousie na yung mga bintana,” said Elita Cabael, one of the residents in Legacy of Light Village. In addition to the physical repairs, residents continued participating in various community activities, from the DZMM medical mission four days after the typhoon to the hosting of the 4th Bayanijuan Football Festival, where players and parents alike were welcomed to a day of fun and friendly competition. The story of pagbangon also reflected in the engagement of project partners in water facilities (Solewind Builders, Lorentz, Sunelec Photovoltaic, ADB-JFPR), teambuilding activities for young residents (Ateneo Human Rights Center, Consuelo Foundation, AFI International) and skills training and financial management (Bayan EDGE, Entrepinoy). Again, many thanks to everyone who have been part of Bayanijuan’s kwento ng pagbangon. 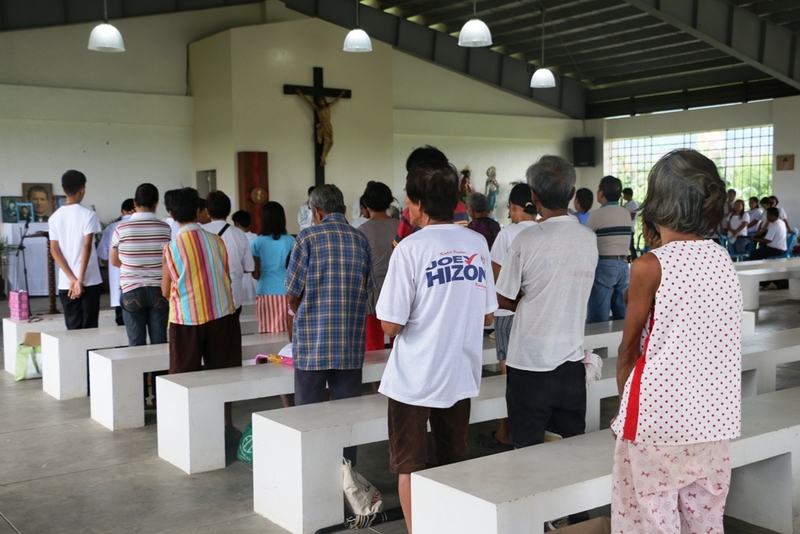 A Thanksgiving Mass - With all the help that they received to rehabilitate the community, in a span of one year, residents gathered at the Chapel of Two Hearts last July 16, the same day Typhoon Glenda happened, to utter prayers of gratitude to everyone who joined the spirit of bayanihan that helped them bring back and build a better BayaNiJuan sa Southville 7 Calauan, Laguna.